Location: Ferriéres-sur-Sichon, in the Allier departement of France (Auvergne Region). Notes: Château de Montgilbert is a medieval fortress in ruins in the town of Ferrières-sur-Sichon 25 km southeast of Vichy in the Allier (France).250, during the reign of St. Louis. In 1280, it was bought by the family Aycelin Montaigu, rich burghers of Auvergne, which are subsequently ennobled. By marriage, the castle passed to the family of Vienna. However, from 1434-1439, during the Hundred Years War, it is forfeited to Rodrigue Villandrando, Spanish mercenaries in the pay of King Charles VII. Significant changes (bastion, external enclosure ...) conducted there. During the Renaissance, Montgilbert becomes less and less a place of residence for its owners, the family of Saulx-Tavannes. Religious wars bloodying the country, and the Bourbonnais is definitely part of France. Under Louis XIV, the owners live in the courtyard. Some parts of the castle were abandoned and ruin begins. 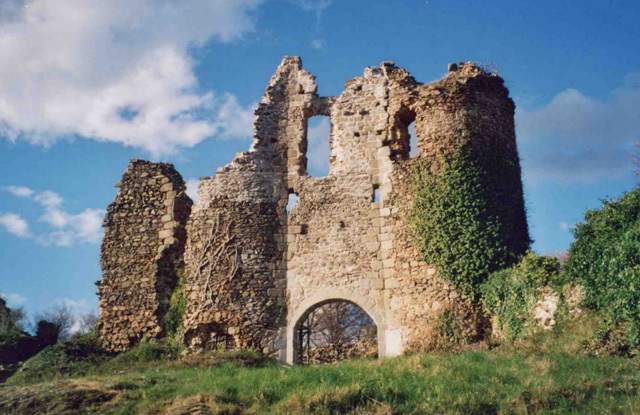 Around 1770, the last heir of Jean Baptiste Bravard Eyssat Duprat, returns to Montgilbert with her mother, to get him to leave that old fashioned castle would have décheviller the roof. In 1793, the castle was sold as national property. In the nineteenth century, it serves as a quarry for nearby residents, which only accelerates his ruin. It was listed as a historic monument on October 11, 1930.